You have a great logo and slogan and you have researched and established the branding you want for you small business. But are you living up to that branding? Most small business owners believe they are living up to their branding and ideals, but when it comes to what their business delivers, they may not be. How many times have you eaten at a restaurant that claims on its menu to have the “best” burger in town? And how many times has the burger been “ho-hum?” “Home of the Best Burger” is a clear brand statement – and it is easy to claim it. Living up to that statement is another story. Making claims in your branding statement that you cannot back up, is setting your business up for problems. Many small businesses relentlessly focus on establishing their brand’s credibility – usually by delivering reliable, dependable products or services. But if your small business stops there, you may be missing an opportunity to solidify your company brand even further. Small business marketers must become more than just a credible brand. They should transform themselves into a brand that customers and potential clients are actually proud to associate with. The design and feel of your office space, retail space or reception area says something about your brand, as does your live incoming call greeting and your voice mail announcement. Even the way you and your staff dress when you interact with customers can be making a brand statement. This does not necessarily mean uniforms or a dress code, but it does mean dressing in an appropriate manner that reflects your image. For example, if the perception is that you are a casual company and you greet customers in a three-piece suit, then you are not living up to your branding. It is also important to remind your staff that they are brand “ambassadors” when delivering your product or service. More importantly, give them the resources to live up to and deliver your branding consistently. If your branding message is “High Quality for Less”, don’t give your staff low-quality tools and expect them to live up to your promise. Small business marketers must strike the right balance between creating a unique identity and delivering those unique customer experiences. In fact, when you deliver those special experiences, it can be the most significant driver of your brand’s uniqueness. Examples of companies that do not deliver on their branding are common: The service company that claims their customers are their most valuable asset, but sends them into automated phone system “hell” when they call with a problem; the delivery company who promises fast, on-time deliveries but is always late; and the computer repair company that claims to be “Green Friendly” but does not recycle old parts when they remove them from customers’ computers. These examples are all giving customers a mixed branding message. 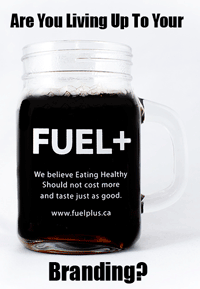 An example of a company that does live up to its branding is a coffee shop in Toronto called Fuel +. Their slogan is “We believe eating healthy should not cost more and taste just as good” – and they live up to that statement. They have plenty of healthy snacks that are comparably priced with other coffee shops, and their staff is trained to know what goes into making them. When you deliver on your brand promises, your customers will reward you with loyalty. Yes, from time to time you might fail at delivering your brand promise. But look upon this as your chance to correct things and show your customers that you are willing to keep to your promise of genuinely delivering what your brand stands for.